Home / News / Showbiz / Viral / Brother of Hashtag Franco Became So Emotional, Cries While Giving A Message! Brother of Hashtag Franco Became So Emotional, Cries While Giving A Message! 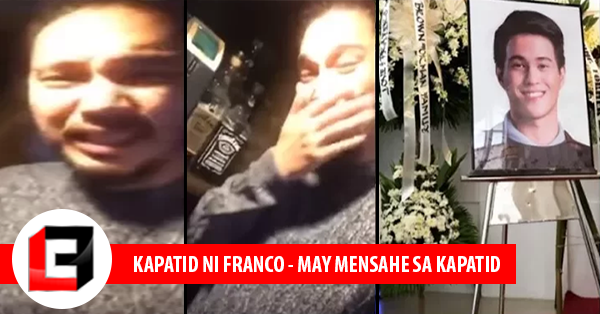 This is probably one of the most emotional videos you can watch regarding Hashtag Franco. Franco Hernandez ‘ big brother made a short video blog giving a video message to his beloved baby brother who loses his life in a drowning incident a few days ago. An “It’s Showtime” group member of Hashtag loses his of drowning, in an incident at sea when they are on their way back to the shore of North Lamidan, Don Marcelino in Davao Occidental, because they have just visited Tom Doronal’s resort. Franco Miguel Hernandez Lumunlan was with his girlfriend, fellow Hashtag member, Tom Doronal and two others. When big waves crashed against their motorized boat that caused Franco and his girlfriend fell off the boat. With the help of the boat operator and its crew, they were saved from the sea, but when the body of Franco was retrieved, it was still unconscious. He was brought immediately brought to Estacion Medical Clinic in the neighboring town of Malita to be revived, unfortunately, he was declared DOA on arrival by the attending physician three in the afternoon, today, Saturday, November 11. Franco’s death was confirmed by his talent agency, Cornerstone Entertainment, and sent an update to ABS-CBN News through MJ Felipe and reported it to Ogie Diaz on DZMM Radyo. But prior this, some Hashtag members, co-hosts, and friends are already posting their sorrow for this great loss of a friend. His career in the showbiz industry just started and he had just celebrated his 21st birthday on Showtime last April 2017. Lots of fans may have been saddened by this early loss, but one really cannot predict your own time. Let us extend support of prayers of strength to those family members and people who loves Franco dearly. May his soul rest in peace.